A Cooper’s Hawk came through a yard in the 2500 block of Glenayre eyeing up a bird feeding station. A Sharp-shinned Hawk was seen at a bird feeding station in Coombs. A female Ring-necked Pheasant was spotted in the residential area of Columbia Beach in Parksville. A flock of Red Crossbills was seen clipping Fir cones off the trees at Jack Point. A Northern Harrier was spotted flying over the Quality Foods in Qualicum Beach. Two Evening Grosbeaks have joined Varied Thrush, Steller’s Jays, Dark-eyed Juncos, and Red-breasted Nuthatches at a feeder in Deep Bay. A Northern Shrike was seen in the 2500 block of Glenayre and Cosgrove Drives in the Departure Bay area of Nanaimo. Twenty-seven Bald Eagles were spotted south of Chemainus on the Chemainus River. A single Western Meadowlark was seen at Pipers Lagoon Park in Nanaimo. Six Common Loons were spotted in Northwest Bay in Nanoose. A Northern Shrike was spotted in a backyard in Stephenson Point in Departure Bay Nanaimo. We will meet at Parksville Community Park at the parking lot near the Lions Playground at 9:00 A.M. The Sunday bird walk on January 6 will be at Buttertubs Marsh off Buttertubs Drive in Nanaimo. We will meet at the bird store at 9:00 a.m or at the marsh at 9:20a.m. 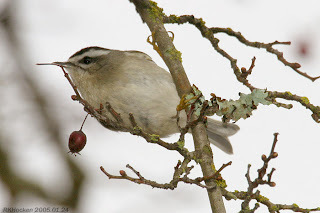 The Nanaimo Christmas Bird Count took place yesterday, December 30. We had great participation with nearly 100 field counters and at least 10 backyard feeder count participants. 19 teams covering 20 areas managed a total of 117 species. Highlights of Count Day included Northern-pygmy Owl at Westwood Lake, Mourning Dove and Bonaparte’s Gull on Gabriola Island, Red-throated Loons in north Nanaimo, Townsend’s Solitaire in north Nanaimo and a Townsend’s Warbler on Nanaimo Lakes Road. Thank you to everyone who joined us on count day and hope to see you back next year. 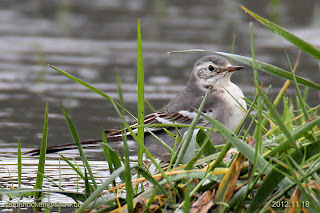 Citrine Wagtail: Ralph Hocken Photo. From the birdstore gang--- Colin, Dennise, Tyler, Lexi, Ralph, Natlie, Ryan, Neil and Marilynne. The Sunday bird walk went to Neck Point Park in Nanaimo. The morning was cloudy with rain showers and windy on the Strait of Georgia. 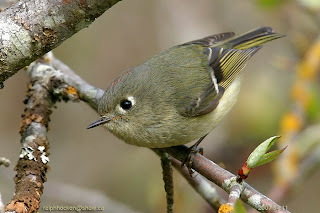 The highlights included seeing flocks of Ruby-crowned Kinglets and Golden-crowned Kinglets. One Western Grebe was on the strait just off shore. 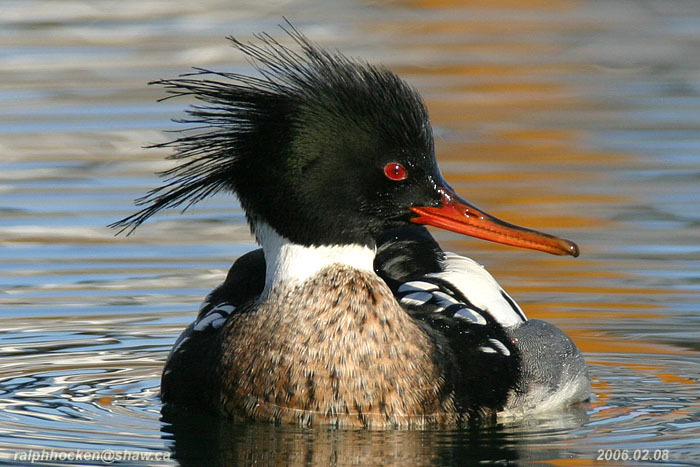 Bufflehead, Pacific Loon, Common Loon, Double-crested Cormorant, Pelagic Cormorant, Common Goldeneye, Harlequin Duck, Western Grebe, Horned Grebe, Common Merganser, Red-breasted Merganser, Common Murre, Spotted Black Oystercatcher, Bald Eagle, Thayer’s Gull, Glaucous-winged Gull, Northern Flicker, Northwest Crow, Chestnut-backed Chickadee, Red-breasted Nuthatch, Golden-crowned Kinglet, Ruby-crowned Kinglet, Bewick's Wren, Pacific Wren, Anna's Hummingbird, Spotted Towhee, Dark-eyed Junco, Purple Finch, Song Sparrow, Pine Siskin. “Rare bird alert-Little Gull” A Little Gull was seen at Ambleside Park in West Vancouver. 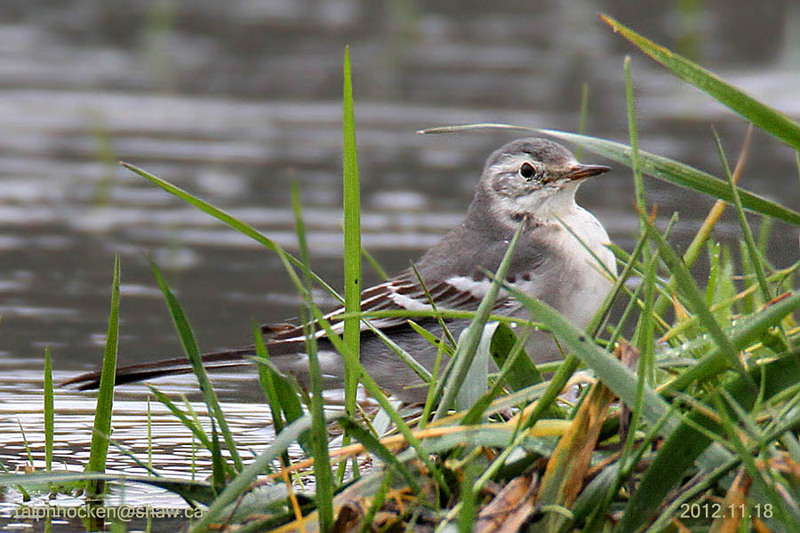 The Citrine Wagtail is still being seen in Courtenay. A Northern Shrike was seen in a backyard at Dover Road and Uplands Drive in north Nanaimo. The Tuesday bird walk went to Rathtrevor Provincial Park in Parksville. The morning was mostly sunny and warm in the bright sunshine but a little cool in the forest. There was a huge monster tide of 17.3 feet. Near the parking area we saw at least ten Golden-crowned Sparrows feeding under the fence in the snow. A flock of twenty to thirty Black Turnstones flew in looking for the shoreline, but it was limited because of the high tides. They finally settled on the point to feed. Eight Black-bellied Plovers, two Killdeer and two Black Oystercatchers shared the point with the Turnstones. Four Brant, Surf Scoters and Black Scoters flew over the water heading down the Strait. 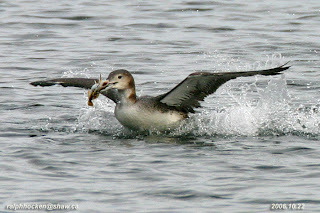 We spotted four Long-tailed Ducks, two Western Grebe, a raft of Common Mergansers as well as a raft of Red-breasted Mergansers further out from shore. Brant, Harlequin Duck, Surf Scoter, Black Scoter, Long-tailed Duck, Bufflehead, Common Goldeneye, Barrow’s Goldeneye, Common Merganser, Red-breasted Merganser, Pacific Loon, Common Loon, Red-necked Grebe, Horned Grebe, Western Grebe, Double-crested Cormorant, Pelagic Cormorant, Bald Eagle, Black-bellied Plover, Black Turnstone, Killdeer, Black Oystercatcher, Glaucous-winged Gull, Downy Woodpecker, Northern Flicker, Northwestern Crow, Common Raven, Red-breasted Nuthatch, Chestnut-backed Chickadee, Golden-crowned Kinglet, Varied Thrush, Spotted Towhee, Golden-crowned Sparrow, Song Sparrow, Dark-eyed Junco, Purple Finch, Pine Siskin. Three Greater White-fronted Geese were seen on Departure Bay near the Kin Hut and Departure Bay Road in Nanaimo. Nanoose Naturalists begin the New Yew year by sharing nature artifacts, photos and stories from 2012. Everyone is invited on January 10th at 7:00 P.M. We meet at Nanoose Library Hall on NW Bay Road. nanoosenaturalists.org . There will be no Sunday Bird Walk on December 30, 2012, The Sunday bird walks will resume on January 06, 2013. We will meet at the bird store at 9:00 a.m.
Christmas Bird Count—Duncan, January 1, 2013. There will not be any bird walks on December 25 or January 01, 2013, The Tuesday bird walks will resume on January 08, 2012. The Sunday bird walk went to Buttertubs Marsh. The morning was clear but quite cool. The highlights included seeing a flock of twenty Common Redpolls, a large flock of about two hundred Pine Siskins, twenty Varied Thrush and large numbers of American Robins. We were entertained by three Merlin flying about chasing one another, calling the whole time. Trumpeter Swans, Canada Geese, Mallard, Bufflehead, Ring-necked Ducks, Wood Duck, Gadwall, American Coot, Bald Eagle, Red-tailed Hawk, Merlin, Barred Owl, Hooded Mergansers, Glaucous-winged Gull, Great Blue Heron, Anna's Hummingbird, Downy Woodpecker, Northern Flicker, Rock Pigeon, Steller’s Jay, Common Raven, Northwestern Crow, Chestnut-backed Chickadee, Brown Creeper, Bewick's Wren, Bushtit, Red-breasted Nuthatch, Varied Thrush, American Robin, Cedar Waxwing, European Starling, Spotted Towhee, Song Sparrow, Fox Sparrow, Pine Siskin, Common Redpoll, Golden-crowned Sparrow, Red-winged Blackbird, Dark-eyed Junco, House Finch and House Sparrow. 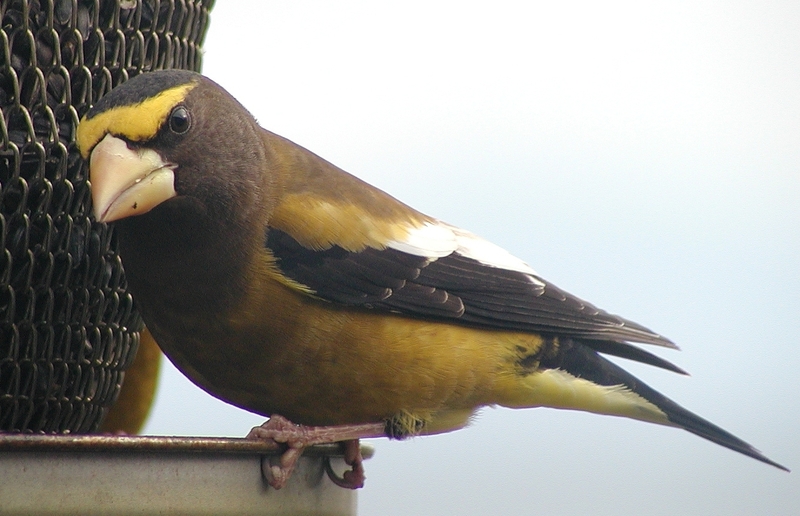 Six Evening Grosbeaks were seen in a yard at French Creek. Directions to specific location: From Courtenay, cross the 17th St. Bridge (Courtenay River). Turn right onto Comox Road (Dyke Rd) until the Pumping Station on the right hand side of the road. There is a dirt road across the road with a For Sale sign on the left. Walk up the dirt road towards the steel chain blocking vehicle access. The Wagtail has been observed next to the dirt road, at the furthest brush pile. Northern Harriers, Short-eared Owls and a Northern Shrike were seen at the Nanaimo River Estuary in south Nanaimo. The Tuesday bird walk went to the Plummer Road side of the Englishman River Estuary in Parksville. The morning was cloudy with a few sunny periods and wind off the Strait of Georgia. A male Anna’s hummingbird perched on a snag just off the trail giving us great looks at the colorful Hummer. The resident Northern Harrier put in a quick appearance as it flew over the estuary and disappeared behind some bushes. A Northern Shrike perched in a tall conifer overlooking the estuary. Later the Shrike perched on a short bush just past the viewing platform not twenty feet from us. A flock of Common Murre flew just above the water heading down the Strait of Georgia. A flock of Evening Grosbeaks flew over the trail. We watched a male Downy Woodpecker feeding in a low bush with a Ruby-crowned Kinglet feeding on the bush just below him. Common Raven, Eurasian Collared Dove, Anna’s Hummingbird, Chestnut-backed Chickadee, Red-breasted Nuthatch, Ruby-crowned Kinglet, American Robin, Varied Thrush, European Starling, Evening Grosbeak, Spotted Towhee, Fox Sparrow, Song Sparrow, Golden-crowned Sparrow, Dark-eyed Junco, Red-winged Blackbird, Brewer's Blackbird, House Finch, Red Crossbill, Purple Finch and Pine Siskin. A Greater White-fronted Goose was seen in with a flock of Canada Geese in Maffeo Sutton Park in downtown Nanaimo. A juvenile Gyrfalcon was seen and photographed cruising over the field before the Citrine Wagtail was spotted in Courtenay today by birders from Washington State. A Snowy Owl was seen in the 5400 block of Kenwill Drive in Nanaimo. Forty Trumpeters swans were seen at the Big Qualicum River Estuary. “Rare Bird Alert--Citrine Wagtail” The Citrine Wagtail was seen in the same location at Courtney by birders from Nanaimo. 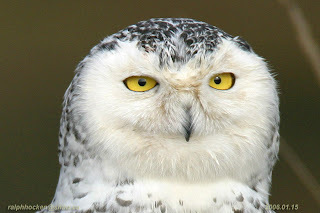 A Snowy Owl was spotted beside Hub City Gravel Pit on Nanaimo River Road. at Rathtrevor Park at about 9:10 A.M.
Hammond Bay Road at about 9:20 A.M. The Tuesday bird walk went to the Plummer Road side of the Englishman River Estuary in Parksville. The morning was cloudy with a few sunny periods and wind off the Strait of Georgia. A male Anna’s hummingbird perched on a snag just off the trail giving us great looks at the colorful Hummer. The resident Northern Harrier put in a quick appearance as it flew over the estuary and disappeared behind some bushes. A Northern Shrike perched in a tall conifer over looking the estuary. Later the Shrike perched on a short bush just past the viewing platform not twenty feet from us. A flock of Common Murre flew just above the water heading down the Strait of Georgia. A flock of Evening Grosbeaks flew over the trail. We watched a male Downy Woodpecker feeding in a low bush with a Ruby-crowned Kinglet feeding on the bush just below him. 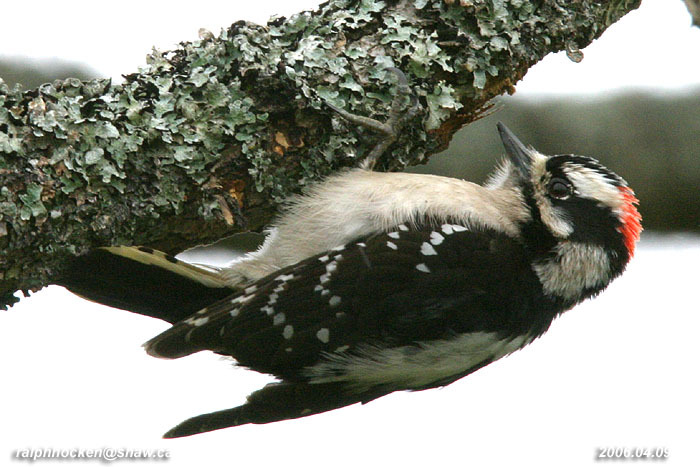 The Tuesday bird walk on December 18, 2012 will go to Rathtrevor Provincial Park in Parksville. The tide will be high--there is a monster tide of 17.3 feet predicted at 9:50 a.m. Snowy Owl: Ralph Hocken Photo. There was a Snowy Owl spotted in the 5400 block of Kenwell Drive in north Nanaimo today. The Sunday bird walk went to Nanoose Bay. The morning was rainy with strong winds off the Strait of Georgia. The highlights included seeing two Eurasian Wigeon in with American Wigeon. Four Cackling Geese were spotted in with the Canada Geese. A Peregrine Falcon flew over and landed at the top of a conifer tree giving us great views through the scope. Green-winged Teal, Surf Scoter, White-winged Scoter, Bufflehead, Common Goldeneye, Mallard, Greater Scaup, Northern Pintail, Black Oystercatcher, Great Blue Heron, Bald Eagle, Peregrine Falcon, Mew Gull, Herring Gull, California Gull, Thayer's Gull, Glaucous-winged Gull, Northwestern Crow, European Starling, Redwing Blackbird, Brewers Blackbird, Spotted Towhee, Song Sparrow, Golden-crowned Sparrow and Dark-eyed Junco. A Barred Owl was seen along Centennary Drive in Nanaimo. A Spotted Sandpiper was seen at Sunset Beach in Neck Point Park in Nanaimo. Sixty-seven Bald eagles and fourteen Great Blue Herons were seen at Marshall Stephenson Sanctuary off Kinkade Road in Qualicum Beach. Over twenty Brown Pelicans are still being seen in the inner harbour in Victoria. The Tuesday bird walk went to the Englishman River Estuary on the Shelly Road side in Parksville. The morning was mostly sunny but there were occasional clouds and a few light showers. The winds were calm. We spotted a Greater White-fronted Goose at the Community Park in Parksville to start the morning. As we started the walk a Varied Thrush put in a quick appearance and disappeared into the forest. We could hear Red Crossbills high in the conifer trees. There were plenty of immature and adult Bald Eagles perching high in the trees and flying throughout the morning. A Sharp-shinned Hawk flew overhead near the Englishman River and a Peregrine Falcon was perched high atop a snag near the viewing platform. We watched a male Anna's Hummingbird hawking insects as we ended the walk. Hairy Woodpecker , Northern Flicker, Pileated Woodpecker, Red-breasted Sapsucker, Steller’s Jay, Northwestern Crow, Common Raven, Chestnut-backed Chickadee, Red-breasted Nuthatch, Brown Creeper, Bewick's Wren, Pacific Wren, Golden-crowned Kinglet, Ruby-crowned Kinglet, Varied Thrush, European Starling, Spotted Towhee, Song Sparrow, Golden-crowned Sparrow, Dark-eyed Junco, Red-winged Blackbird, Red Crossbill and Pine Siskin. Road and Shorewood Drive at about 9:10 A.M.
off Bowen Road at about 9:20 A.M.
Christmas Bird Count—Parksville/Qualicum Beach, December 16, 2012. Christmas Bird Count—Duncan, January 1,2013. Citrine Wagtail seen on December 08. The Citrine Wagtail was seen today December 08. It was seen along the trail next to the last bush pile this morning. 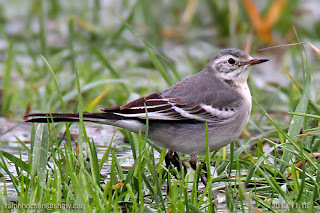 The CITRINE WAGTAIL is still present in the original location today, December 5th. The flooding has subsided. The Tuesday bird walk went to the Englishman River Estuary on the Shelly Road side in Parksville. The morning was mostly sunny but there were occasional clouds and a few light showers. The winds were calm. We spotted a Greater White-fronted Goose at the Community Park in Parksville to start the morning. As we started the walk a Varied Thrush put in a quick appearance and disappeared into the forest. We could hear Red Crossbills high in the conifer trees. There were plenty of immature and adult Bald Eagles perching high in the trees and flying throughout the morning. A Sharp-shinned Hawk flew overhead near the Englishman River and a Peregrine Falcon was perched high a top a snag near the viewing platform. 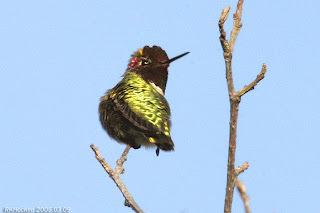 We watched a male Anna's Hummingbird hawking insects as we ended the walk. 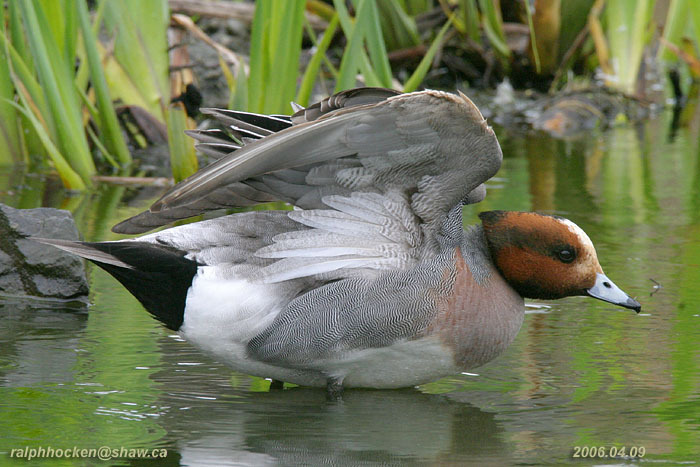 The Tuesday bird walk on December 11, 2012 will be going to the Plummer Road side of the Englishman River in Parksville.